I would like to say happy birthday to Muhammed Ali who I haven’t had the opportunity to meet, but his life has been a strong influence on me and I still admire him today. When I was growing up in the 70s I remember watching the wide world of sports on ABC with my brothers and my dad and we watched all of the great heavyweight fights from that era. I remember watching sports reporter Howard Cosell go back and forth with the champ and I remember hearing folks say that they argue like an old married couple. Ali would shout about how great he was and how attractive he was. He would boast about his accomplishments and what he planned to do next. And he would do most of this in the form of a rhyme! I didn’t understand the psychology behind his actions until I was much older. When I ask myself how many images were on TV that depicted African Americans in a positive light, my answer was not many. Other than James Brown proclaiming that he was Black and proud, how many shows on TV in the 70s brought this before America? None. You see, if Ali was great and he matched the color of my skin, then subconsciously I had the potential to be great too because we were the same color. The point is clear: Ali made greatness possible for every minority. The path he lit stayed bright for me and my pursuits. He saved me from a lifetime of hang ups regarding my appearance, my intelligence, inferiority and my possibilities. I can because Ali could. And I’m glad he took the time to send the future generations a message. A message that I got loud and clear! Thanks Ali! For me, you will always be the greatest of all time! Previous Post Are you really faithful? I share the sentiments, bro. I paid tribute to this great man on my FB page on his birthday. 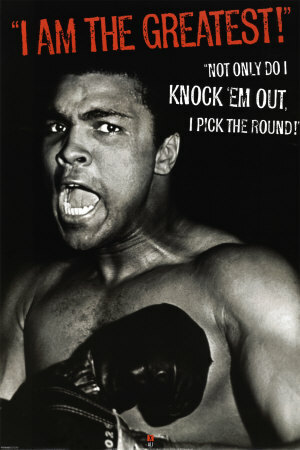 My first son’s middle name is Ali in honor of him. Thanks Bro! That’s awesome! He is a living legend who really did shock the world in more ways than one. Thanks again!